The Hawks fought out a thrilling 3-3 FA Cup fourth qualifying round draw against Cheltenham Town at Westleigh Park. The Conference National visitors led 2-0 early in the second half before Dan Strugnell pulled a goal back. The Robins restored their two-goal lead, before James Hayter and Matt Paterson earned the home side a well-deserved replay. The two teams will meet again at Whaddon Road on Tuesday night. A four-hour trip to Truro produced two goals for Gosport Borough but only one point as they shared the spoils with their hosts in the National League South. Veteran Justin Bennett and new-boy Rowan Vine both found the target but Alex Pike’s men were unable to find a winning goal in Cornwall. 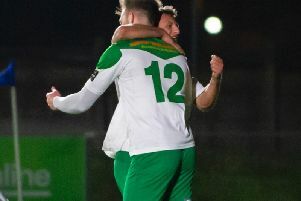 Bognor’s FA Cup dream died at Wealdstone as Jason Prior had two penalties saved in a battling team performance that deserved a happier outcome. The Rocks carved out the first chance after three minutes, when Prior crossed for Snorre Nilsen, but the Norwegian’s header was off-target. Rampant Petersfield powered past a downcast Aylesbury United side to claim an impressive 6-2 away win. The Rams led in the fourth minute when Ryan Woodford headed home from a Joe Briggs corner. The visitors doubled their lead on 31 minutes, when they broke clear on the right and Briggs pulled the ball back for Alek Przespolewski who smashed a low shot into the net. The goals rained in in the second half with Aylesbury pulling one back on 56 minutes from the penalty spot through Jake Bewley, before Alex Lowley scored on 59 minutes. Briggs made it four with a spectacular goal before the hosts hit back through Sonny French only for Howard Neighbour to make it 5-2 a minute later, with substitute Gary Norgate completing the rout.